Seasons are changing and wild animals are on the move. Our proximity to wild life can be charming. On any given day on my way to or from work I see possums, squirrels, rabbits, raccoons, groundhogs, wild turkeys, hawks, geese, and probably too many deer. All within the city limits. With this in mind, it’s not surprising that all these creatures and probably some others wander in and out of my yard. Last year when bunnies were eating my green beans, I decided to get a humane cage-trap. Lately I haven’t noticed any rabbits in the garden, but I was leaving some fruit in the cage, just in case. When you have two 4-year-old daughters, half-eaten random pieces of fruit are readily available and are a great bait. For a while the same raccoon would get in the cage, eat the fruit and have to wait for me to get back from work to let her out. I have never noticed any raccoon damage, so I would just release her. I open the cage, she walks out slowly, and looks back at me as if to say, “Get some more juicy fruit in there, and I’ll see you later.” I haven’t been leaving fruit in the cage, so it’s been a while since last time I saw my raccoon pet. 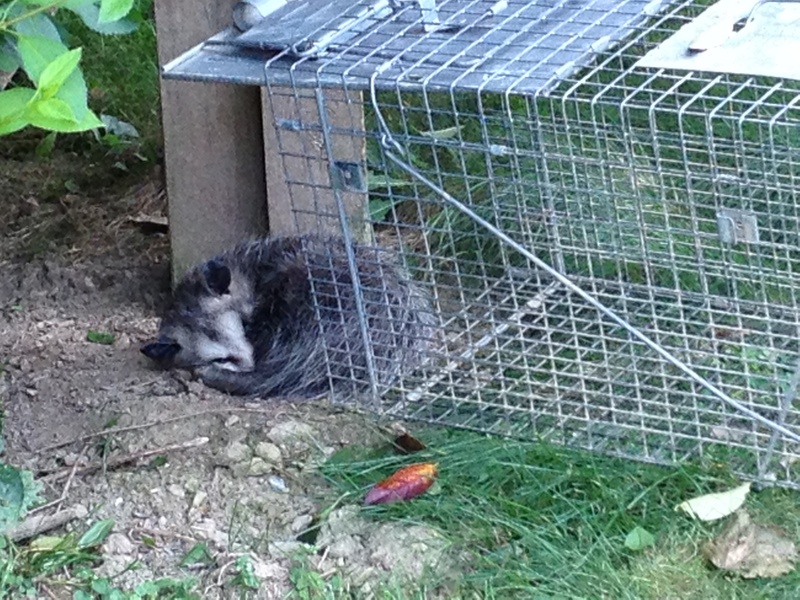 Last time I let the possum out it was so sleepy that it took a few steps out of the cage and went to sleep until dark.